Rain washing away the leaves and the trees is a beautiful sight we all appreciate. But for many of us without leaf screens, rain means clogged up gutters and blocked downspouts. No matter how big of a rain storm it actually is, we can’t avoid but be out there in the rain clearing up the gutters getting rid of all the leaves and fallen objects that are blocking them. It is at times like these when we regret not investing in gutter covers and leaf screens. They are meant to protect our downspouts from getting blocked and to make our life easier. The chances of getting a clogged gutter are less likely when you have gutter guards covering them. Debris such as leaves, twigs, grass, bird nests, and kid’s toys can get in the gutter and then flow down with the stream and block up the downspouts. This can cause lots of stress for you. Gutter covers and leaf screens prevent that from happening. Clogged gutter overflow and run down the wall causing unsightly stains and water damage. They also overflow over the top and cause a water fall onto the ground causing puddles, standing water that can seep into foundations. It’s also a slip-and-fall hazard. You will have to spend less on the maintenance charges with gutter guards and leaf screens in action. Gutters usually require cleaning twice a year; once in spring and once in fall. Without guards, the gutters will eventually get blocked. Especially if you live in a neighborhood with lots of trees around you where, if not the small objects then the leaves would be enough to block up the waterways. It would need frequent cleaning on your part as well as you spending money to call up maintenance services to get the gutters cleaned and running again. Rain and leaves together form a deadly combination which causes a lot of corrosion in the gutters on your rooftops. If you have them properly covered you will be increasing their life by protecting them from catching rust. Standing water in gutters can be hazardous to your health as well It can be a breeding ground for mosquitoes and other pests. Easy flow of water is possible with the covers and leaf screen since the rain water can flow through your gutters with ease without overflowing at all. If you are looking for gutter covers and leaf screens then go for the ones made out of aluminum. Because they are more durable and come in many different colors as well. For commercial buildings it is important to install galvanized steel gutters. Since they do not rust easily this is a better value. There are several kinds of leaf screens and covers available. You probably want one which is durable and affordable. So it makes sense to call a pro like us. Because we deal with these every day. And we can guide you in the right direction with what’s best for you. We deal with only the best quality products. So we can help keep the gutters in your homes working right for a longer period of time. 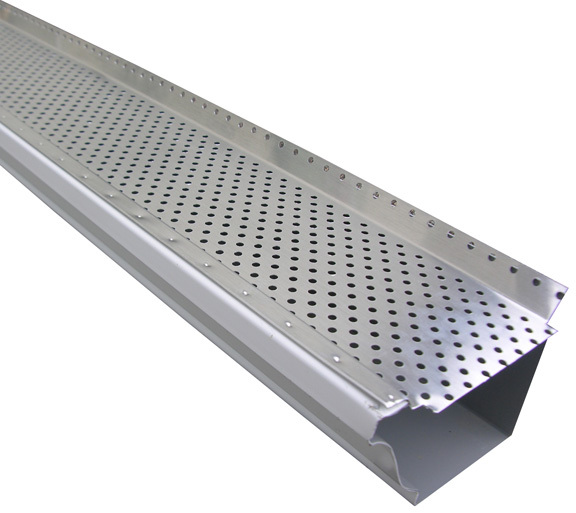 We carry several kinds of leaf screens and other gutter protection products. Even if you don’t have trees in your yard we strongly recommend installing leaf screens on your new rain gutters. Any object on your roof will eventually end up in your gutter. And when more builds up it will clog the downspout. The last thing you need to be doing is trying to unclog a downspout in a rain storm. So adding leaf screens to your rain gutters will assure you of year round protection from overflowing gutters. And clogged downspouts too! For more information contact us. We will make sure that you can enjoy rains without worrying about your gutters anymore.